MANVEL — Manvel has had their way with the last three district opponents after playing perhaps the toughest non-district schedule in the Houston area. 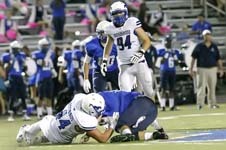 The Mavericks picked up wins over Westfield and North Shore before getting three easy wins over District 22-6A teams. The Mavs have coasted past Pasadena Dobie (35-17), Pasadena (63-7), and South Houston (52-7) for a 5-0 overall mark and 3-0 in league play. 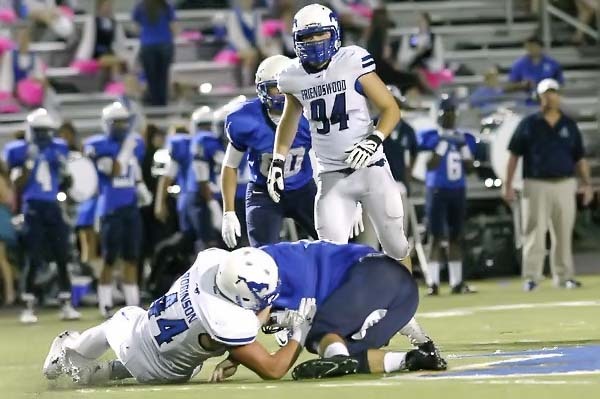 But the road gets tougher as the Mavericks will travel to The Rig in Pearland to face the Dawson Eagles (4-2, 3-1) who lost a nail-biter to No. 5 state-ranked Pearland 15-6. The game wasn't decided until there was only :47 seconds left in the game with the Oilers leading 8-6. A one-yard score by Pearland secured the hard-fought contest, but Dawson proved they were a team that can't be taken lightly. Manvel is well coached and head coach Kirk Martin knows he has the talent to compete with anyone in the state and he will make sure his players are ready for the challenge. Meanwhile, it was ho hum against South Houston as the Mavericks took out the Trojans early after building a 49-0 halftime lead. It was the Gary Haynes and Deriq King show in the opening period as the pair hooked up for three of the first four scores of the game. Haynes caught two 10-yard scoring passes for a 14-0 lead and then Haynes grabbed another 5-yard scoring toss to make the score 28-7. In between, South Houston managed to score on a 26-yard run to cut the lead to 14-7, but Qyalan Clay scored on a 3-yard run to make the score 21-7. Todd Maxwell got in on the scoring parade as he gathered in a 33-yard touchdown pass from back-up quarterback Kyle Trask with 11:53 still left in the second quarter. King returned to hit Keylon Stokes on a 34-yard scoring pass at the 4:26 mark of the second period and then Haynes found the end zone one more time as he gathered in a punt and put the finishing touches on his game with a sensational 70-yard touchdown return and a 49-0 halftime lead. With only :53 seconds left in the third quarter, Lucas Harvill booted a 37-yard field goal to make the score 52-7 and that would be the final. Manvel finished the game with over 500 yards of total offense while South Houston could manage only 192. King was 13-of-22 passing for 215 yards and four TDs. Trask was 6-for-6 for 114 yards and one score. Clay led the ground attack with five carries for 93 yards and one score. Haynes had four catches for 45 yards and three TDs. Todd Maxwell had two grabs for 63 yards and Stokes had three catches for 48 yards and one TD.